Emergency management authorities in North Carolina said an earlier toll of 17 had risen to 25 since Florence made landfall Friday as a Category 1 hurricane, with its aftermath threatening further flooding as well as potential dam failures and landslides. Six deaths have been confirmed in neighboring South Carolina, with the latest being the driver of a pickup truck who drove into standing water in Lexington County. 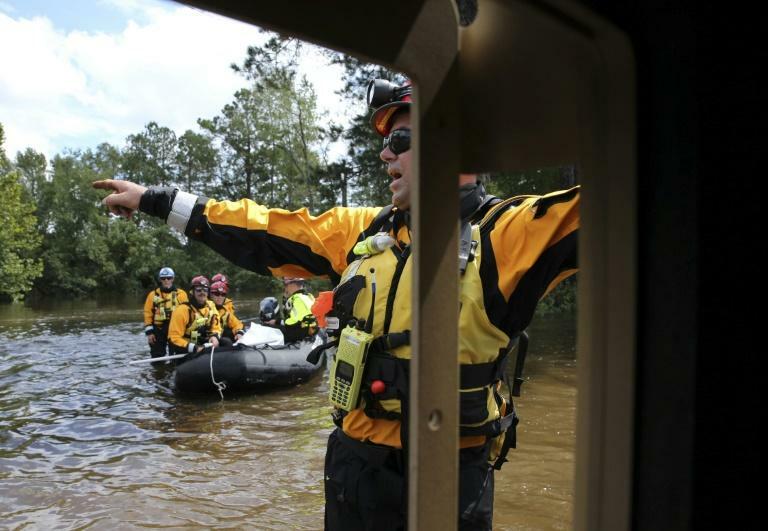 "River flooding is dynamic and it's happening all over our state," North Carolina Governor Roy Cooper told reporters. "This is an epic storm that is still continuing," Cooper said. "This is a monumental disaster for our state." In Virginia, near state capital Richmond, emergency services said one man died after a building collapsed during severe weather, though it was not clear if that death was directly linked to Florence. More than a dozen rivers across North Carolina were at major flood stage on Monday or threatening to rise to critical levels. "Many roads in our state are still at risk of floods," Cooper said, warning people who have been evacuated not to return home yet and others not to go out if they do not need to. "Please don't make yourself someone who needs to be rescued," he said. Wilmington, on the banks of the Cape Fear River in North Carolina, was almost completely cut off by land but emergency management teams managed to truck food and water overnight into the port city of 120,000 people. North Carolina emergency department officials said 23 truckloads of Meals, Ready to Eat -- packaged US military rations -- and crates of bottled water had been sent into Wilmington. And a wave of solidarity rippled through hard-hit New Bern, where hundreds of people lined up as a local supermarket distributed fried chicken and hamburgers. "This community, the most marginalized and economically deprived in town, has been hit the worst. They are still is without power," said Braden Welsh, one of those behind the initiative. "We wanted to pump their spirit up." Local artist Kevin Bryant praised the effort, saying "it's good to get some support." "I lost everything in the flooding," he said. "We didn't think it would be that bad. It happened so fast." The National Weather Service released rainfall totals as of 2:00 pm (1800 GMT) for parts of North Carolina. The largest amount so far was in Elizabethtown, which has received 35.93 inches (0.91 meters). The most rainfall recorded in South Carolina was in the town of Loris, where 23.81 inches (0.6 meters) fell. More than 300 people remained Monday at a shelter on the campus of the University of North Carolina in Raleigh, the state capital which escaped the brunt of the storm. 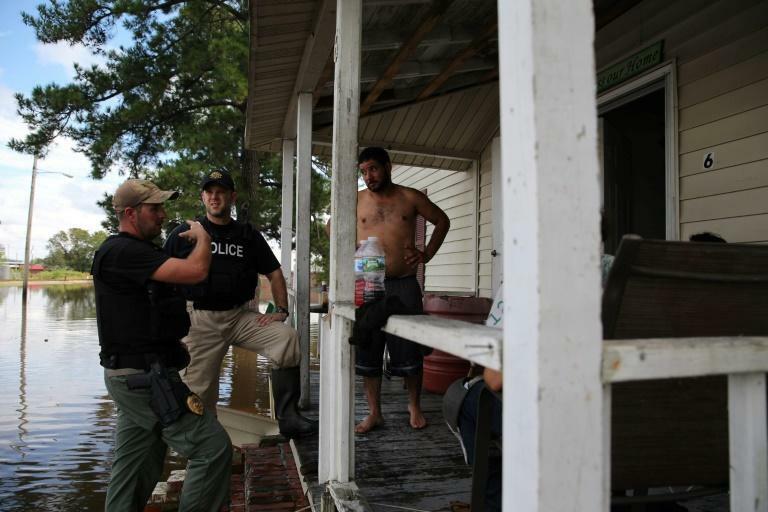 Thomas Hammett, of Otway, North Carolina, said he has been in the shelter for nearly a week with his two children, Jerry, 11, Christopher, three. "We had to evacuate. It was too dangerous to stay," Hammett said. "Some people have died down there." "The neighbors told us our home was fine apart from a few branches down, so that's a relief at least," he added. "We can't wait to go back home and live a normal life again, hopefully on Wednesday." In Fayetteville, the Cape Fear River was expected to reach major flood stage at 58 feet (17.6 meters) on Monday and to hit nearly 62 feet (18.9 meters) on Tuesday before receding. Some half a million customers in the Carolinas were still without electricity on Monday, according to emergency officials. The National Weather Service said there is an "elevated risk for landslides" in North Carolina. State officials said there had been a small dam breach that did not cause any significant damage and they were monitoring other structures closely. Numerous roads across eastern North Carolina were blocked by fallen trees and flooding including parts of I-95, a major north-south artery. 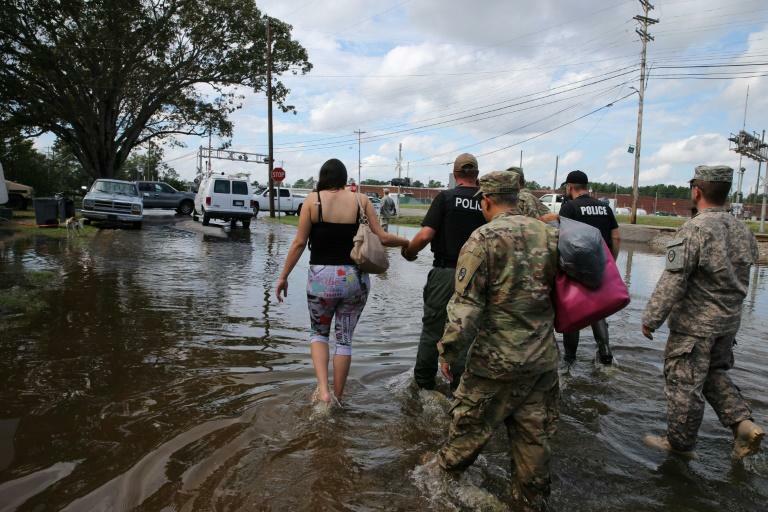 Secretary of Homeland Security Kirstjen Nielsen visited North Carolina on Monday to discuss the response and recovery efforts and tour flood-affected areas. President Donald Trump has also announced plans to visit the flood-hit region this week but a date has not yet been set. "We're going to need significant resources to recover," Cooper, the North Carolina governor, said.